On June 19, Continental and United announced an agreement to form an alliance that will allow travelers to book seats on either airline’s flights. While not a full-blown merger, the tie-up has far-reaching implications, as each airline has access to the other’s route network. Continental will also join Star Alliance, the international airline marketing group that includes United, US Airways, Lufthansa, and Air Canada, among others. This will finally put an end to the speculation surrounding United and Continental’s on-again-off-again affair, which has been going on for months. United, in perhaps the deepest financial trouble of all the country’s legacy lines, has reportedly been courting Continental for a while. Continental, in the meantime, has been playing the field, discussing deals with British Airways and American, and has already left United standing at the proverbial altar once. It’s not drama on the Brangelina level, but it has been drama nonetheless. As for the alliance itself, the concept is simple: An extensive network link-up will allow broad codesharing at home and joint international ventures involving the two airlines and the Star Alliance group. On the frequent flyer end, passengers will be able to earn and redeem their program’s miles (including elite miles) on both airlines and use either airline’s airport lounges. The appeal of this arrangement lies in its simplicity. Since the airlines aren’t merging, there is no need to integrate workforces, consolidate overlapping routes, or close hubs. In fact, neither airline has to do much at all, except for Continental, which needs to deal with its marketing agreements with Delta, Northwest, and SkyTeam. There are several areas where the two airlines don’t match up. Continental doesn’t charge a fee for the first checked bag, but United does (in fact, Continental’s CEO recently expressed doubts about the idea—curious timing, given the United news). Continental also offers complimentary meals on many domestic flights, while United charges for onboard food. 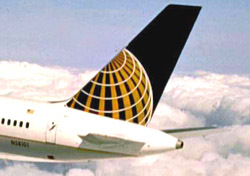 United international service features three cabin classes, but Continental only offers two. Hopefully the airlines will address these issues in the near future. More importantly, though, the alliance will have to pass the antitrust test for international routes. United already has an antitrust-immunized agreement with Air Canada, Lufthansa, and other Star Alliance members, and Continental is hoping to join that group. My guess is that this immunity will be granted, following the recent precedent set by Delta and Northwest. So what’s in it for travelers? On the surface, the alliance should bring more choice and flexibility for travelers, though it’s difficult to say by how much. As with any airline tie-up, though, antitrust concerns will surface, and customers will understandably expect fares to rise. We’ll just have to wait and see.